In an earlier article we discussed about the Difference Between Microservices and API Based Cloud Services. 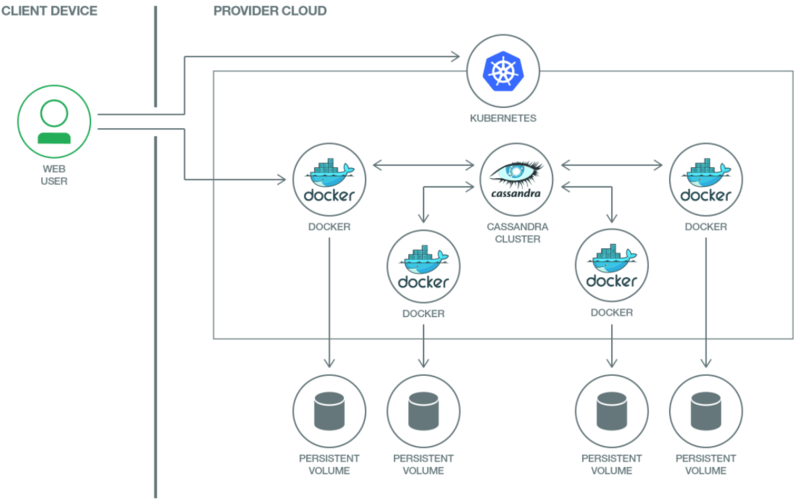 A natural question may arise in the mind of those who newly started reading or learning the related things – What is the Relationship Between Microservices, Docker and Kubernetes? Analysis of Docker in DevOps is a bigger matter, which we have done beforehand. An API is an abstraction which encapsulates a set of complex operations behind an interface. A microservice is an independent component in the system that encapsulates all functionality within a highly cohesive area in a situation. Microservices is a software development technique, which also known as microservice architecture. Which helps to make an application a collection of loosely coupled services. The microservice architecture helps in deployment of very large and complex applications. It also aids to evolve and grow the technology stack of an organization. Microservice architecture helps to develop software applications as independently deployable, small services in which every service runs a process and communicates through light weight mechanism to serve business goal, aims and objectives. Microservice architecture pattern language consists of patterns for applying microservice architecture. Microservices are a development trend, which basically means SOA with restrictions like small as possible services size, storage isolation, independence of releases, teams, stacks and possibly other many things. Microservices are often packaged into VM to run services. Those packaged services can be run in a container manager. That container manager CAN be Kubernetes. Microservices is a architecture which advocate the separation of an application into a set of less complexed tasks focused little applications. These applications needs to be deployed and as part of a bigger one needs to know each others and communicate. Kurbernetes comes to help mostly for the deployment but also the communications of these applications. By default, Kubernetes uses Docker to run images and manage containers. Nevertheless, Kubernetes can use other engines, for example, rkt from the CoreOS. In general, Kubernetes is an easier-to-configure, more mature and functionally rich analog to the Docker Swarm. Docker, and other container systems, have made it easier to deploy microservices systems. Whereas in the past you may have needed entirely separate machines, virtual or otherwise, to host them you can now provide smaller instances. Kubernetes is infrastructure abstraction for container manipulation. In Kubernetes there are many terms that conceptualize the execution environment. A pod is the smallest unit deployable in Kubernetes. Pods have volumes, memory, networking requirements, unique ID. A Service is a logical set of pods that are permanent in the cluster. Pods are accessible through the service names in the network of the cluster. Since Docker came out, we can do most of your infrastructure prerequisites incredibly fast by containerizing your application. Microservices in Docker containers are easy to administer by a DevOps team. That is why many organizations have adopted microservices with infrastructure standard technology so that deployment and releasing can be standardized but development can be independent, small and focused. This Article Has Been Shared 8812 Times! Here is a guide to Shellshock Bash Vulnerability Patch for Infrastructure managed Rackspace Cloud. You should be careful about Nova-Agent. We can automate WordPress installation with Puppet running on Ubuntu instance on Rackspace Cloud Server for our own multiple WordPress sites. A Universal Digital Prescription Standard is a Real Need for Work on Cloud Computing Platforms as Chances of NSA Spyware Activities is More. Cite this article as: Abhishek Ghosh, "What is the Relationship Between Microservices, Docker and Kubernetes," in The Customize Windows, April 12, 2019, April 18, 2019, https://thecustomizewindows.com/2019/04/what-is-the-relationship-between-microservices-docker-and-kubernetes/.